Winter is a great time to challenge myself. I hate the cold and prefer to hybrinate inside next to my warm… sewing machine. This is an ongoing process, but here is a collection of my pieces to date with this theme. 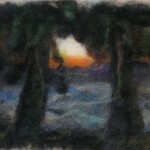 I hope you enjoy this slideshow of some of my newer pieces of quilt art. Visit my Wall Art Exhibit to learn more information about each piece and how to purchase it. Decorative art wall hangings: Is that the right direction? I’ve discovered another loved fiber art technique: Needle felting! It’s great fun made by hand from pure wool fibers. The basics are that you use special needles with barbs along the shaft. These barbs help to weave the fibers of the wool as you punch the fibers on a felt base. 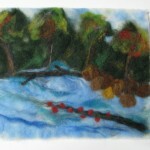 I’ve learned so much from others who enjoy felting and are incredibly talented at it. Visit Debra at //www.etsy.com/shop/Deebs. Her work is amazing and she has been kindly sharing her knowledge with me. Debra refers to this process as “wool painting”. Together with my friend Marina we have been creating beautiful artwork using this technique. Just today we spread out Merino wool fibers in a wet felt process and made felt mats, which will be used as the basis for later art projects. Here are a couple of examples of some new pieces I made this week that are for purchase via my Etsy shop. Let me know if you want to learn to do this. It’s handmade so required supplies basically consist of wool fibers and needles. I found a local store to buy the supplies, called HabayitShelBitik. The Israel Quilters Association recently held a quilt exhibit featuring the theme “100 Years of Kibbutz”. Each quilt had to be 1.3 m x .9m (51″ x 35″) and had to touch on some aspect of kibbutz life. The quilts were judged and there were several winners. 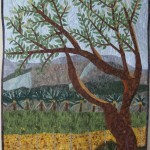 Although not all the submissions were shown, 56 quilts were shown for the month of May at Beit Gavriel, a lovely hall on the south shore of the Kinneret. I submitted a quilt for this exhibit and my work was exhibited. 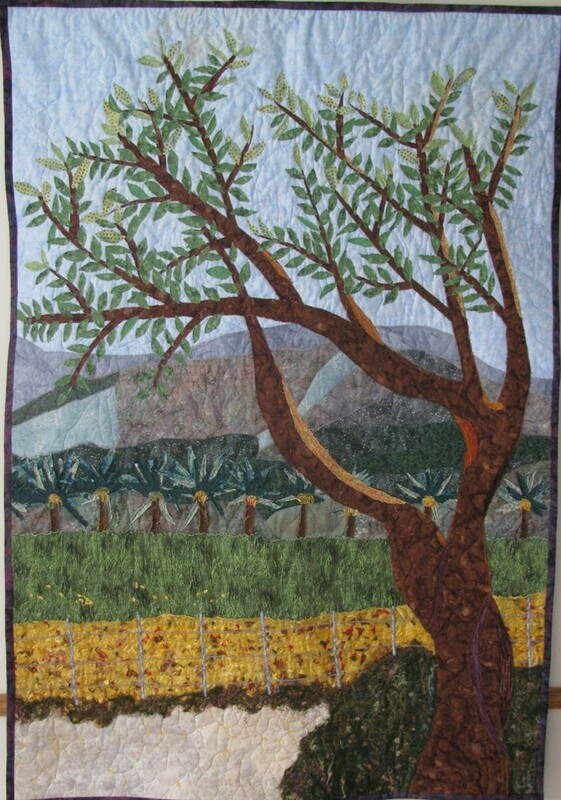 I based the quilt on a view of the fields of Kibbutz Shluhot, showing Mt. Gilboa in the background in Emek Beit Shean. I think the view from Kibbutz Shluhot is beautiful and it reminded me of almost 30 years ago when I volunteered on the carrot factory on Kibbutz Shluhot and lived on Kibbutz Maaleh Gilboa. I tried to convey the quiet and serenity of the scene in my quilt.The quilt has a three-dimensional quality, that makes you feel you are entering the scene. A journalist visited the exhibit and did a short video about some of the quilts that were exhibited and won prizes. The video also discusses the Israel Quilters Association. It’s very nicely done. The exhibit may be shown again in another locality in Israel. I will keep you posted!